Look at this appalling parking job! Oh wait, that car looks familiar ... oh yeah, that's Heather's car! Seriously, Heather, that is just sad ... drinking that early in the morning ... tsk tsk tsk. Chad's and my Dell desktop PC has been acting extremely slow for a couple years. It's only about 3 years old but we only got it with 256 MB of RAM installed, so I'm guessing we need to update the RAM. So I started looking into it and I found a good deal on 2GB of RAM. I looked into it a lot to make sure I was buying the right kind of memory for our machine. Anyway, I ordered and and couldn't wait for it to come. It came in the mail yesterday and I opened up the computer to install it. I tried it once and it didn't work, so I then realized I hadn't pushed it in all the way, so I fixed that and guess what? It still didn't work! I'm so upset. I don't know what the problem is. I shouldn't have tried to get a good deal. Hopefully I can get it working, otherwise I'll have to find a way to sell these to someone else or something because they probably just aren't compatible with my machine even though they should be. Isn't this the cutest thing? This is what you see when you walk by Greg's office. His computer monitor completely blocks his face. You can sometimes see hands on either side of the computer and feet sticking out from under the desk, like the Wicked Witch of the East ... and that's actually kind of appropriate. Haha, just kidding. Anyway, Heather stuck this on his monitor today and he didn't notice until Linda went in and started laughing hysterically (if you know Linda, you know the laugh!). Greg grabbed the picture and balled it up and threw it over my head into the trash can. It was actually a pretty impressive shot, but what a spoil sport to throw it away. It was so nice! Haha. By the way, if you know Greg, you'll probably agree that this photo is pretty appropriate for him! Attention everyone, this is a high fashion blog entry! Haha. Actually, this might be one of my geekiest/dorkiest moments - as a certain someone was keen to point out all day long. Anyway, I ordered these gloves that are connected to the computer through the USB port and have two little built in heaters. They work pretty well, except that in order to still function I have to keep the majority of my fingers exposed so I can move the mouse around and type. Hopefully I'll get used to them and I'll find that they help keep my hands warm, because I desperately need it! I was just sick of them always being so cold. They broke through the wall this week on our expanded office space. It was pretty exciting during the Monday morning staff meeting when they were doing something noisy. It sounded like sawing some metal or something. Anyway, I hope this means they will be done on time. They are supposed to be finished by October 1st I think. Change is always exciting, huh? It's the time of birthdays in the Joslyn family. Last Sunday was my mom's birthday and Matt's birthday and next Saturday is my Dad's birthday. So Erin and Matt graciously offered to host a dinner birthday celebration tonight. We had quite a feast and then we had lemon-raspberry jello cake for dessert. I gave my parents some framed pictures I took during our trip to Friday Harbor. I hope they enjoy them! So a couple days ago I posted a picture of some roadwork near my house. Well, there was even more street re-paving work closer to home, right down the street. When I drove through last night I saw that they had put up these cylindrical traffic cone things on top of the manhole covers. It was funny because some people were driving around them (like me) and others drove through them like an obstacle course. I snapped this photo and at first was upset that it didn't come out well, but then realized that it was actually kind of cool so I decided to post it. Violent Rain or Weak Trees? Whenever there is a significant rain storm or when there is a lot of wind, there are invariably a number of branches that come crashing down from our tree. We came home a few days ago to see this one out in the street right where I usually park. This should probably convince me to always park in the back, but for some reason I don't ... not sure why. There have been so many roadwork projects going on in our area. They have been repaving roads and all kinds of stuff, no to mention the drastic work being done on Route 309 (when will it be done?!?!?!). Yesterday on my way home I saw this nonsense on Tookany Creek Parkway. Today I saw that they had stripped up the road, presumably to repave it. So there was a ledge about 3 inches high you had to drive up on. I hate that. 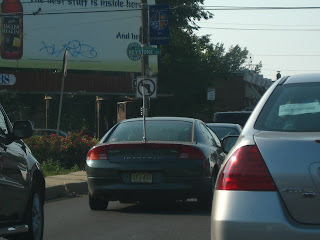 Some of you may recognize this wonderful intersection and you will know what this picture is trying to show. For the rest of you, I'll try to explain the frustration that this picture is trying to capture. What you see here is me sitting at a RED light at the intersection of Fellowship Rd. and RT. 73 in Mt. Laurel, NJ. I am stopped at the line waiting to turn left. What you see in front of me is at least 6 cars that have pulled out into the intersection waiting to turn left, and on the left hand side you see the cars going straight in the opposite direction that continue to advance into the intersection and go straight through even though the light has turned red. Therefore, these cars waiting to turn left can't go until those cars have passed. This happens every day. Now, the interesting thing here is that there is only ONE left turn lane. The lane to the right of me is a STRAIGHT only lane. However, you'll notice 3 cars that are trying to turn left from that straight only lane. People are doing this CONSTANTLY and it forces those of us who go over into the left turn lane at the appropriate time to sit through multiple lights. On an average day it takes at least 3 changes of the light before I can turn here. And a change of the light takes approximately 4 minutes. On really good days, I only have to wait through 1 or 2 changes and on really bad days ... well, let's not even go there. This has got to be one of the worst intersections I've ever seen and people are so rude and unable to deal with it. Yesterday on my way home there was all kinds of police and fire department activity on the south bound side of Rt. 73. As you can see in this photo (maybe, if you squint and get really close to the screen) is an electric box on a telephone pole on fire! It was crazy!! I wonder how put that out, I assume you don't spray it with water! This weekend I made some Peach Jam using peaches from the fruit share of our CSA. The jam is delicious but it didn't solidify as nicely as the blackberry jam did. I think the problem is in the quantities. The recipe called for 4 cups of chopped peaches (3 pounds). But when I cut up my peaches, I had closer to 6 cups, I think, but it only weighed about 2.5 pounds. So that didn't make sense, but I just followed the recipe as it was anyway using all the peaches. I think the problem is that there were too many peaches. I probably could have cooked it a bit longer, but I don't think that would have made much of a difference. Anyway, if I put it in the refrigerator, it gets a little more jelled and it's not so runny that you can't put it on toast or scones. I also took some advice and just turned the jars upside down after filling them and I let them cool like that overnight. This morning they were all sealed and everything and I never had to process them in a hot water bath or anything. So it looks like I'll be able to store them outside of the refrigerator. We'll see! Tonight Chad and I attended a housewarming party for our new neighbors down the street. We made hummus and baba ganoush (no idea on the spelling for that one). Chad cut up the vegetables and made them all pretty. Meeting new neighbors is always fun, especially when they are all as nice as ours! I can't really describe what this picture is or why I took it, but some of you will already know. For those who don't get it ... well, sorry. As I was driving home tonight I saw this car with a crazy antenna on the back. Now what could you possibly need this for? And what happens when they open their trunk? Doesn't it hit the car? I would be afraid of hitting it on something. There are some real weirdos out there, huh? Tiffany brought her new puppy into work today. He is a miniature dachshund. Isn't he the cutest thing you've ever seen? Too bad he got green eye. The red eye remover in iPhoto doesn't work on dogs and cats since their eyes don't turn red like ours do. Isn't that strange? Seriously this dog is so cute. And he was so well behaved and quiet too. Chad and I went outside today to A.) pick some thyme for the roasted vegetables Chad was making and B.) to water the potted plants (Japanese maple, thyme, rosemary, sage, and mint). I was inspired by the lovely minty smell so I made us some mojitos. We sat outside briefly since it was so nice out and had mojitos and read while dinner was cooking. This little mint leaf in Chad's glass was so cute, I just had to grab a photo of it. It's kind of hard to tell what this is at first glance, so I'll just tell you. It's a photo of our sky light in our third floor room. The roofers had to move the light down a bit when they installed the new roof because it stuck out too far (since there were so many layers of crap on our roof!!). Anyway, they had to come in last week and put some trim around the edge since there was just a gap there. This is what they did. You can see that it now needs to be painted, along with some touched up areas on the wall. How lame ... But on the good side, the roofing project is now officially over. I spent a good part of my weekend working from home. I have a report to finish and I wanted a complete draft done by Monday. Well, unfortunately it doesn't look like that's going to happen no matter how hard I try. This was my setup at the desk in the library. Of course, I have to have both my laptops going! It's too bad we don't have stylish computers like my MacBook at work. Haha. Chad and I had to do a couple errands today, including getting haircuts and going to drop off the Comcast digital cable box at the local Comcast center (we hardly watch TV so we couldn't justify the digital anymore). Over by Comcast is a comic book store called Brave New Worlds, which used to be inside Willow Grove mall. I went there all the time as a kid so we stopped in and browsed for a bit. I took this photo with my cell phone. 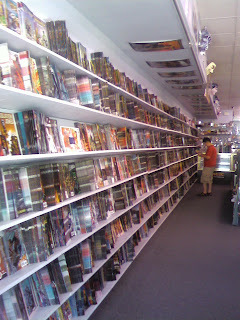 The wall of new comics was huge! Last night (Friday) Chad and I were just so tired we basically passed out. We just couldn't stay awake so we went to bed relatively early for a Friday night and slept until about 9 this morning. It was crazy, but nice to get a good night's sleep. When Andy was here to visit us we made Honey Peach Lassis with yogurt and coconut milk and such. They were pretty good, so Chad and I got some more peaches (we had leftover yogurt and coconut milk) and a pear and we made some more tonight. They were all frothy and tasty!! Yum. Some people in the world can be really thoughtful. My parents bought this raspberry tea for Chad while they were in Friday Harbor because they knew he liked it and it's so hard for him to find it here (actually impossible). Isn't that sweet? I've always been like that too and I'm amazed when people aren't more thoughtful. Check this out. When I got in my car and turned it on today, I saw that my Trip odometer read exactly 666 miles. Creepy, huh? Nothing especially strange happened though so I guess I'm safe! Here are some more comic books I got from one of our local libraries. We were just browsing and I saw the cover of Volume 3 (the one on the far right) and thought it looked really awesome. So I got out all three volumes. They are collections of short stories, all having to do with flight in some way. You can learn more at the website: www.flightcomics.com. We played a lot of video games with Andy this weekend. We focused on 4 games: Mario Party 5, Dr. Mario, Super Smash Bros. Melee, and Mario Kart Double Dash. It was lots of fun. It's too bad I don't have more time to just hang out and play games. Andy came to visit this weekend so Chad and I put together a little vegetarian Indian feast for him (and for us!!). You see in this photo, naan, rice, sesame yogurt potatoes, mung dal with red split lentils, black eyed peas with mushrooms, curried spinach with eggplant and chick peas, and raita. We had honey-peach lassis for dessert later. It was so hot in the kitchen after cooking for HOURS! But it was totally worth it. This is called a fetish. Fetishes are made by American Indians out west. Deb and Bud brought this one back for us from their trip out to the Grand Canyon. It is so beautiful. The blue matches our living room so well. I especially love the tiny little blue eyes it has in the front. Last Friday we stopped by Chad's grandmother's house for a little while with the rest of Chad's family and picked blackberries from the bushes all along the side of her house. Between Chad, me, and the four sisters, we picked blackberries for about 15 minutes or so until we got all the ripe ones. It amounted to about 3.5 cups (I know, it doesn't seem like a lot but it actually was). I decided to try to make jam with them, so before starting the night's cleaning, I followed a recipe (sort of) from the package of Pectin I bought. It made 5 jars of jam and I think it tastes pretty good although it hasn't completely cooled and solidified yet. It's very sweet, but it definitely tastes like blackberries. I'm so excited and it was really quite easy! We're going to go back and pick more sometime when the other berries ripen. Woohoo. Since it's been a while since we did a thorough house cleaning, and it's been a while since someone has seen the house for the first time, we've been working feverishly this week to prepare for Andy's visit this coming weekend (as I think I've already mentioned). So in addition to just tidying up and organizing things, we went a bit farther and got some small projects done that we've been planning for a while. One of them was putting up the lights on our bed, which I already showed you. Another was hanging a shelf over our bed that we've had for ages. The last big one was hanging this awesome Japanese fan near the top of our stairs. The fan is a pain to hang because you have to match two different hooks on the back simultaneously but the fan gets in the way. Anyway, we finally got it up last night or the night before and I think it looks great. When you see it from the side, you can also see the reflection in the mirror at the top of the stairs.